• Same great labels - Now two ways to use them. • Virtually disappear when applied. • Gives a highly distinctive and professional impression to all your mailings. • Suitable for inkjet printers. • Now easier to peel and faster to apply with unique QuickPEEL feature. • Divide the label sheet along the perforation to expose label edges and easily lift the label from the sheet or simply keep the sheet intact and peel the labels as before. Avery Clear Inkjet Labels, for use on white or light colours, give the impression that the packaging has been typed on directly, making it neater and more professional looking. 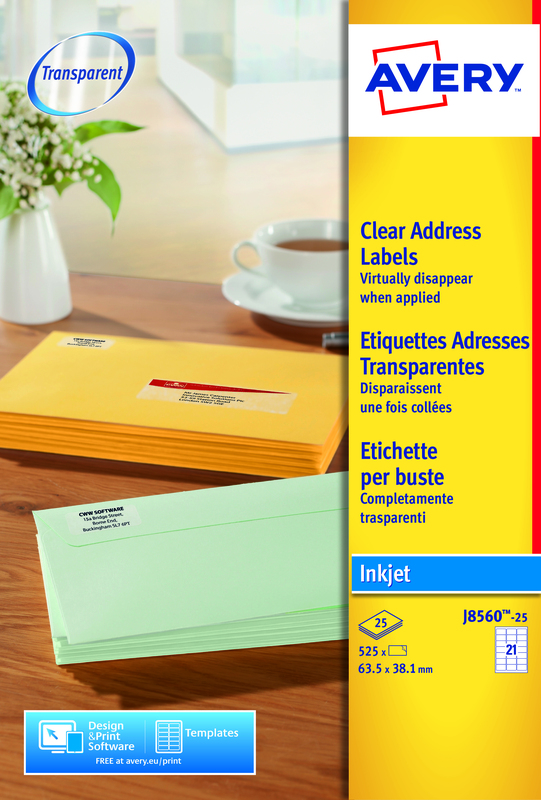 With QuickPeel, the labels are simple to use, streamlining posting and ensuring you get through a large workload with ease. These labels are designed to be used in inkjet printers and are compatible with templates from popular software such as Microsoft Word. 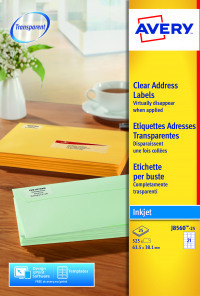 This pack contains 25 sheets each with 21 labels (525 labels in total). mattew dunne | ideal for using to addressing envolopes!